Social media, text messaging, and email have become staples of interpersonal communication in our culture. More and more people are establishing and maintaining long-distance relationships electronically. Yet corresponding this way can lack intimacy, which weakens our relationships with friends, family, and loved ones. Here are four ways to use electronic communication to feel close even when you’re far apart. Images communicate and elicit a variety of emotions. We all know the saying about a thousand words—so instead of a text, send a picture. You can send pictures randomly, whenever the feeling strikes. Ideally, the picture you send should be unique and meaningful to the person who is receiving it. Some people share images from their daily life, while others take snapshots of old photos. When we’re in the same room as someone, most of the signals we transmit and receive are nonverbal. When you cannot hear or see a person, you are missing out on most of the communication required for establishing and maintaining intimacy. But it doesn’t have to be that way. Plan a regular time to participate in a reoccurring video chat with your long-distance loved ones. You can schedule a video chat once a week, less often, or more frequently—whatever works best for you and your loved ones. Some people spend lots of time writing emails for work but little time writing to the special people in their lives. Writing a personalized email allows room for expression, as text messaging can seem choppy and tends to break up lengthy text. Decide on a reasonable goal for how often you will send an email and try to stick to your goal in order to maintain intimate communication. Personalize all your communications and focus on one person at a time. When life is hectic, it’s tempting to post pictures and messages on social media or copy several friends on emails—increasing your audience and communicating with more people in less time. But these approaches significantly decrease the level of intimacy. People tend to feel greater intimacy when they receive one-on-one communication. If your intention is to strengthen a long-distance relationship, it’s best to focus on communicating with that person alone and only include others when it’s really necessary. Staying close when you’re far away can be difficult. 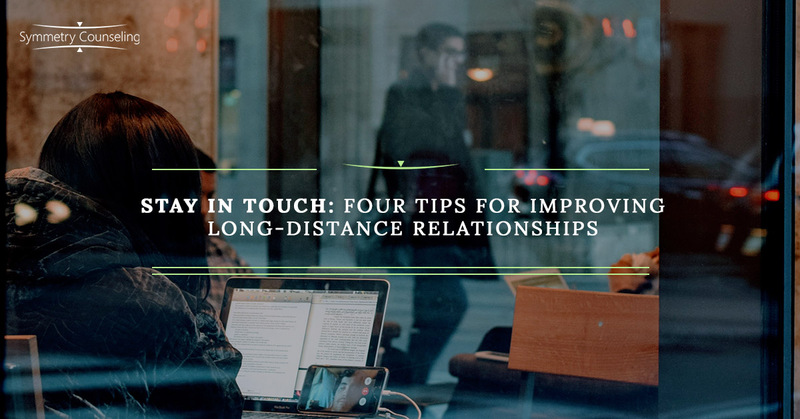 Try any of these methods to improve your long-distance relationships. To discover more ways to improve your relationships, consider participating in individual, couples, or family therapy by contacting Symmetry Counseling.